A 12 Volt Switching Power Supply. 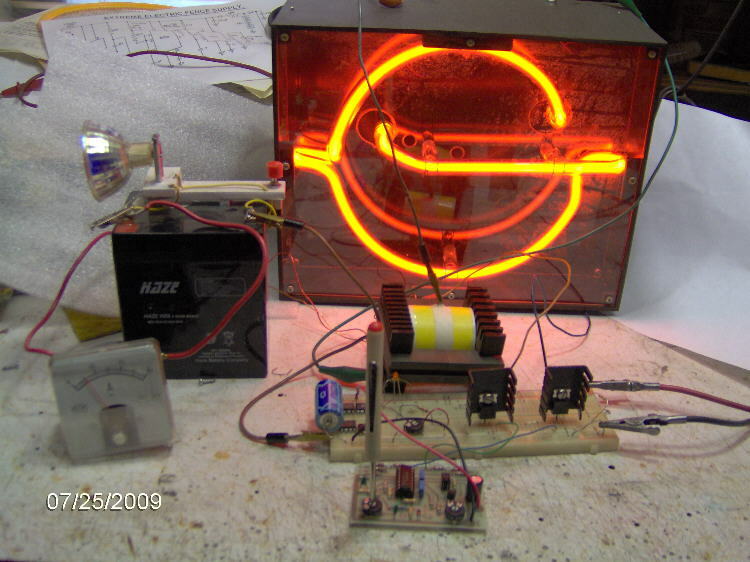 This Preliminary Article Created, "July 21 2009"
"Click Here to go Back to My Projects Page"
This is a good Circuit for those persons needing to Boost or drop a voltage. The Output is High Frequency, but can be Rectified and Filtered to give DC Out. Diodes to handle these frequencies. Normal diodes WILL OVERHEAT and Burn out. 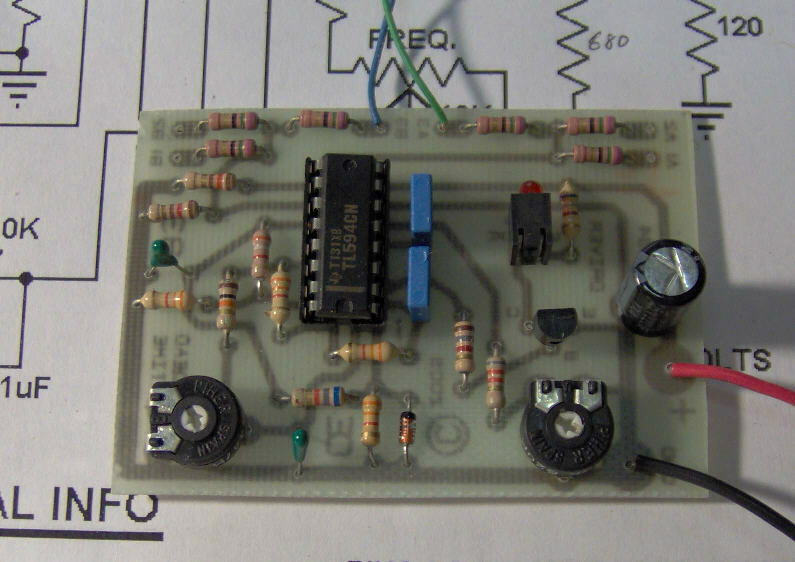 This Circuit is based on a TL594 Integrated Circuit. too high or too low. This will help protect your Battery and Alternator. So if the LED is "ON", The "Circuit has Shut Down". or 6 (with 3 in parallel on each side). So it can handle "LOTS OF POWER". as the Input voltage to T1. 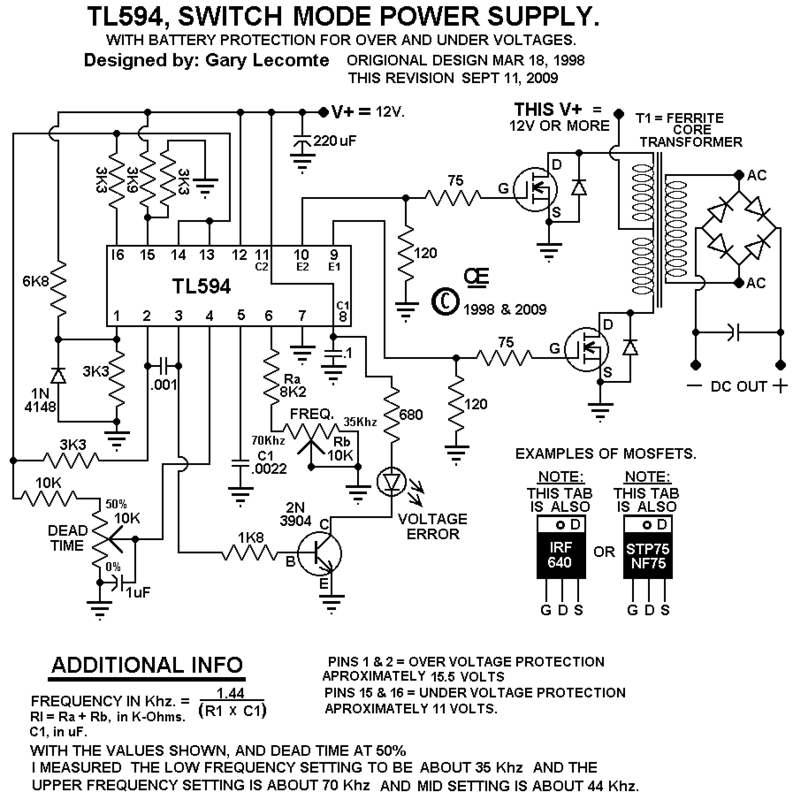 The TL594 Circuit Board Must have a Supply voltage of between 11 and 15 Volts. The Primary winding should be "Bifular" wound, so both winding are identical. "Power requirements", of the transformer your attempting to make. Not all Ferrites are the same. The Disadvantage is the need to use Smaller Wire as the Frequency Increases. WHY, Because the Higher the Frequency, the Greater the "Skin Effect". is Only good for a Current of about 0.577 Amps. make your own, by Bundling numerous strands of an appropriate wire gauge. in a smaller space. Such a wire may be only 0.010" thick, but 0.25 inch wide. possibly efficient up to 10 amps. I can Supply the PCB and Associated parts. Possibly the Ferrite Cores Also, Just Depends on what your trying to do. 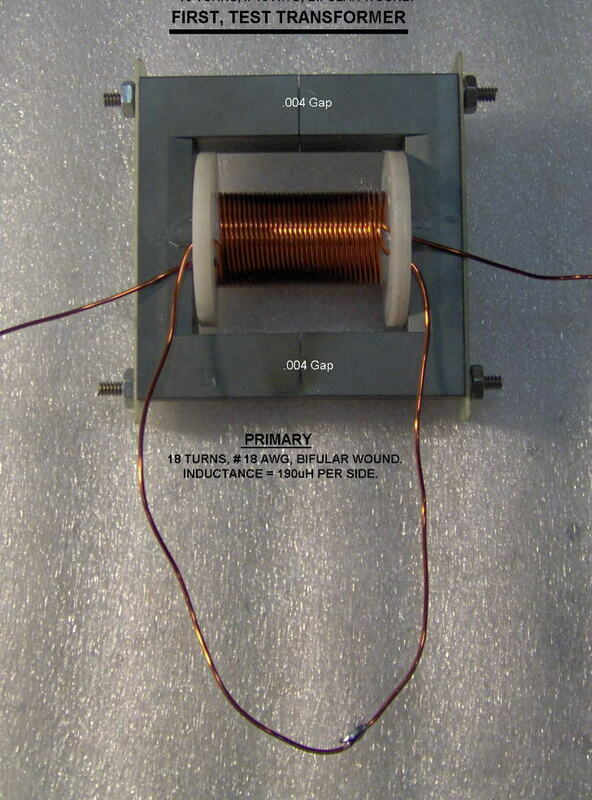 More Transformer winding info Will be coming. 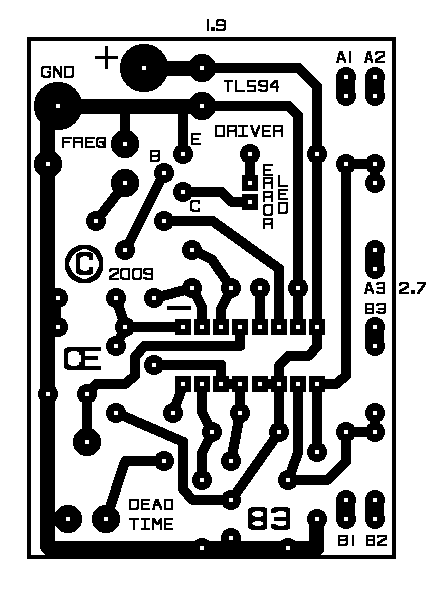 Overlay Picture of this circuit. A Large "E" Core, with a Simple Primary Winding. Just for a simple Test. Than I Wound a Temporary Secondary over this for some output tests. This is a Transformer I made Many Years ago (12 Volts to 12KV). NOTE: These Heatsinks are Too Small and Overheat quickly. Build and Use it this circuit your own risk!